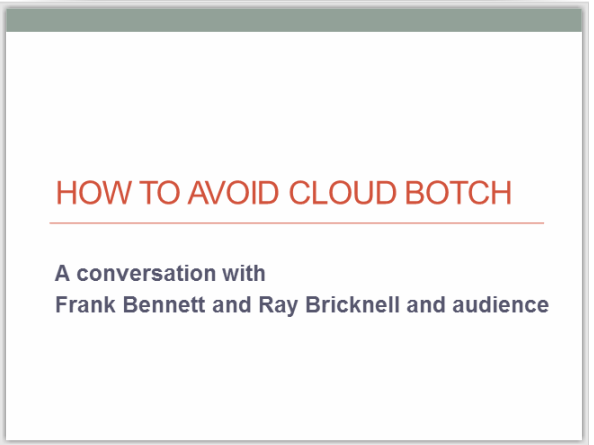 I received an invitation from BrightTalk to present on hybrid cloud and to stir up some controversy so I invited my cloud buddy Ray Bricknell of BehindEveryCloud and we decided on the title ‘How to Avoid Cloud Botch‘. You can access the webcast at BrightTalk, registration is required. The IT business team are only too well aware of shadow IT and pandora’s box of associated risks. Well meaning LOB executives look to the cloud for innovation, the costs are affordable but they are not experienced in conducting due diligence on cloud service providers. 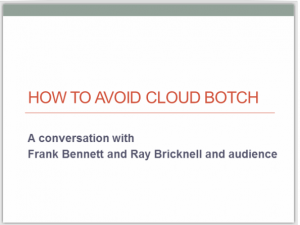 Frank and Ray will explore how you proceed with cloud while not stifling innovation and harmony yet shield the business from the unintended consequences of poorly informed decisions.